Nintendo continues to cash in on its classic video game character, the Italian plumber – Mario!. 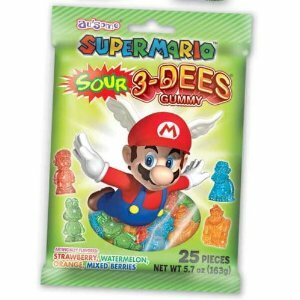 This time they’ve come up with sour and non-sour gummy candies called Super Mario 3-Dees. I tried the sour version because I love sour candy! The gimmick here is the fact that the gummy candies are actually three dimensional figures, like gummi bears. They come in four flavors and four shapes. The flavors are: orange, watermelon, strawberry and mixed berry. The shapes are: Mario, Yoshi, Diddy Kong and Donkey Kong. The shapes do not denote the flavor as some candies do, but rather you could get say 3 Mario shapes in your bag but they can be all different flavors. The candies are all brightly colored with pretty much standard colors denoting the flavors (ie: blue for the mixed berry, orange for orange, etc.) The texture is that of a pretty standard gummy and of course they have the nice sour coating on top that gives a little crunch if you bite into it right away. 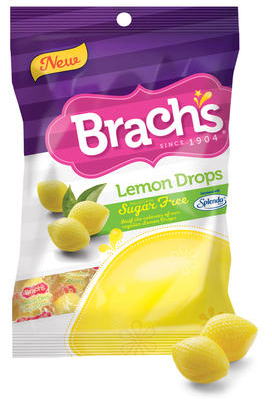 As for the flavors, they are pretty much standard fruit flavors, there is nothing really outstanding about them. It’s pretty obvious that these Nintendo candies will appeal more to kids who just love Nintendo games or the Nintendo collectors out there. The Super Mario 3-Dees really have two things going for them: one is the fact that these are three dimensional candies, not flat like Sour Patch Kids, and two that they are Super Mario characters. Otherwise, they donâ€™t stand out as any better than other similar candies on the market today. If you’re buying them for the flavors, I think you’ll be disappointed but if you love Nintendo stuff or have kids that love Mario, these are great! I like a good sour candy and all the weirdness that accompanies eating itâ€¦. the lip-puckering, the eye-watering, the body-twitching. 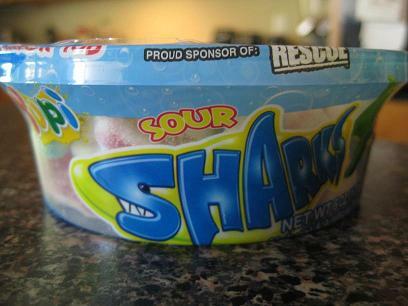 Nowâ€™s your chance to share your involuntary, sour candy-eating reflexes with the world! 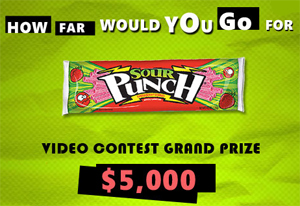 Sour Punch candy announced a contest called â€œHow Far Would You Go?â€ The winner of the contest gets 5000 big ones, and there are some weekly prizes too. Get all the details on the Sour Punch Facebook page.